So the last time we went to our regular farmer’s market, we told you that we picked up some venison. And we made venison stew and it was GOOD. Mmm we miss that stew. But we also picked up some smoked English mozzarella (and regular mozzarella) that we promptly forgot about. Don’t get us wrong – we love mozzarella. And we love supporting our own. It’s just that we got persuaded to buy more mozzarella than we were planning and being a more dry version, it’s the sort that you should really cook, rather than eat for breakfast with tomatoes like the Italians do. If we could eat it just like that, we would. But we like to follow what the farmers recommend and this farmer told us it’s better cooked. And so once we realised we still had it (is anyone else’s fridge like the wardobe in The Lion, the Witch and the Wardrobe?) – we decided to cook the smoked mozzarella on pizza because 1) we like pizza and 2) we couldn’t decide on a better option and 3) if it’s good enough for Nigel Slater, it’s good enough for us. And we’re so glad we did. The smoked mozzarella lends this salty, slightly barbecue-d flavour to the pizza – couple it with a thick, garlicky, tangy sauce and you’re pretty much in pizza heaven. If you can’t find smoked mozzarella, then we reckon you could use another smoked cheese although you might not get the same melt factor. We also used smitten kitchen’s lazy pizza dough recipe but if you know anything about us, we really prefer simple techniques. Prepare the dough and leave for 6 hours. After 6 hours (and when you’re ready to cook), preheat the oven to 260C (fan assisted). Prepare the topping: in a saucepan, heat the oil for 10 seconds. Add the garlic and cook until golden. Add the tomatoes and oregano, stir once and heat until boiling. Then lower the heat to a simmer and cook for a further 15 minutes until the sauce is thickened and less watery. Add the salt and stir. Take the pan off the heat. Grab a baking sheet. Lightly grease with oil and then spread about 1 tbsp cornmeal over the baking sheet. This will REALLY help the pizza not to stick to the sheet. Roll out the dough into a sort of square and then – stretching it with your hands – press it onto the baking sheet. Try to make sure that the dough is even. 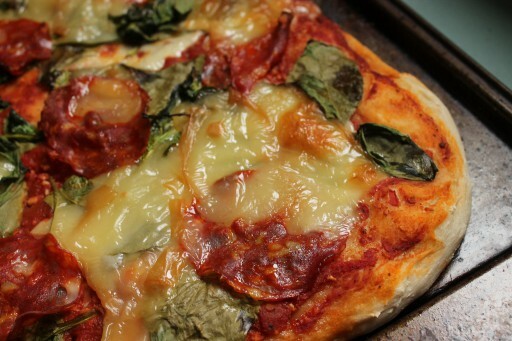 Then spoon the tomato sauce onto the dough evenly. 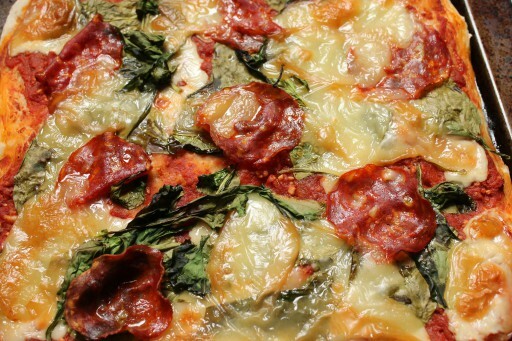 Distribute the spinach, chorizo and mozzarella over the sauce. 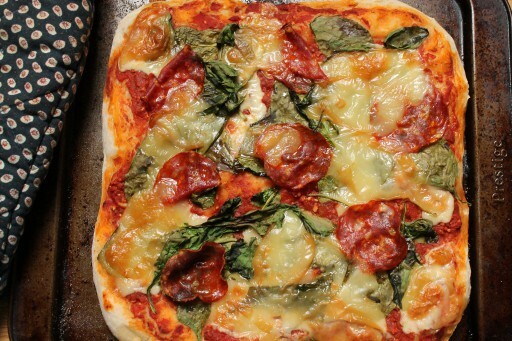 Bake the pizza for 10 minutes until the crust is golden. Thank you my dear! We try to make things look as appetising and easy as possible!